Vintage One: 20 years of Mtn Bike passion and counting. : If Less is More, is More, More? I have always thought that the best thing about 29ers is that they do more with less...less travel, less gearing, lesser tires, etc. See the rise from the ashes of the hardtail as a viable mount for proof of that. But lately I have been riding this beauty around the hills and valleys of So Cal and something interesting has been happening. I am having a LOT of fun. What has really surprised me was how much I am using this bike. I was a bit conflicted when I began to build it up as I was not sure how much I would use it. I am not the type to collect expensive things I do not have a purpose for. Seems vain and wasteful. So I figured that I would use this bike a few times a year for harder, more techy rides, road trips to Moab, etc. Now I find that I am riding it several times a week. Huh...imagine that! Now first off it makes me feel better about building it and not having it sit around. Secondly, it has opened my eyes to what big wheels and some more suspension travel can offer, IF it is packaged well. 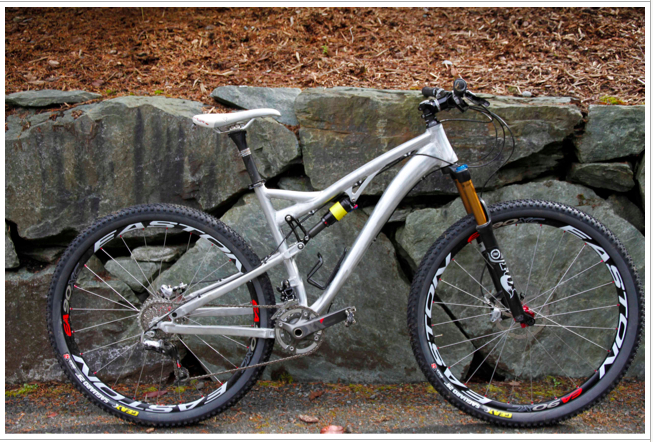 the FSR weighs right at 31lbs and that makes it at least 4 lbs heavier than any bike I own. It pedals really well, has a nice compact back end so is agile, and the slacker HT angle and longer wheelbase is something that you get used to in short order. In fact, after riding this, I always feel like other bikes are too short and nervous. But man, it is a hoot to ride on any trail so far, at least pointed down. I did struggle a bit on a steep climb on singletrack where the slacker HT angle and higher h-bar let the bike's front wheel hunt and peck a bit, but I think I could get used to that and compensate. But other than that...I love pedaling it around. It is geared low (22x34) on the granny side so I can sit and stoke along on long grinds and the de-tuned Mini Brain rear shock keeps everything buttoned down. The slacker HT angle and longer travel makes anything but the smoothest trails a playground. Bounce off of that rock, wheelie over the gap, preload the rear suspension and turn the trail into a pump track. Sooooo fun. And now I see more peeks into 2012, one of them being this 130mm travel Kona Satori. 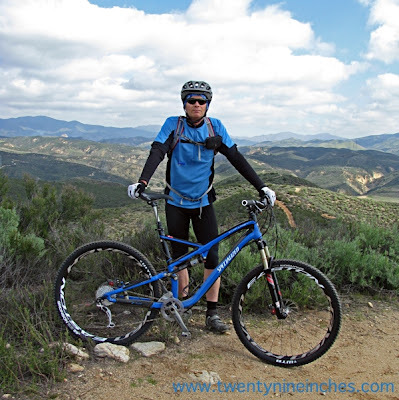 "The inspiration for the bike came from our US sales force, many of whom are die-hard 29er lovers, all of whom are extremely skilled bike handlers who like to push trail and rider limits. The design brief was to make a slacker (head tube angle is 68°), shorter, longer travel (130mm) dual suspension 29er that could find that sweet spot between plush travel and aggressive geometry, without sacrifice climbing efficiency and trail quickness. It’s purposed specifically for those who ride on rough, rolling, technical terrain where big wheels and longer travel enables you to lay to waste anything in your path." Lay waste. Cool. I am still on the fence about whether biggie travel 29er bikes...150mm and more...are something that is too viable, but maybe I just need to ride one to have my vision broadened a bit. But, I am still surprised how very close I am to making a bike like the FSR my #1 rig. I wish it was a bit lighter. That would take $$ in adding parts like an upper level SRAM 2x10 driveline instead of the heavier Shimano 2x9 bits I have on there. I already have carbon bars and great wheels run tubeless. I would not run a smaller tire or give up the Command Post, so really it comes down to new and expensive shifty bits or a carbon frame....and there is no carbon framed FSR...yet. I bet there will be for 2012. And add in the rumored Ibis Mojo 29er that will certainly be carbon and at least 130mm, the new Kona announced recently, the gracefully aging but a bit out of step RIP9, and the DW Sultan and there are a few bikes in this vein to chose from. If you can afford a carbon version when they are out there to buy, or do not mind riding a 30lb bike all the time, then a long legged bike like this is maximum fun-time on trail. Another level down is the Tomac Diplomat, a rumored Bigger Mama from Salsa, and the Intense Spider, all said to be at 120mm. Will 120mm-130mm be the new 100mm? Will 80mm bikes just go away, even for racing? The new JET9 RDO carbon is set for 100mm rear and tuned to a 120mm fork iff'n ya' wanna'. Tall boy too. I said in the past that 100mm or 4" was the sweet spot for a 29er FS in that it is enough to still feel very fast pedaling but still ride pretty rough trails in comfort and control. If that is true, that 100mm is the 'sweet spot', then 130mm just may be the 'fun spot'. In fact, I bet that soon 120mm will be the bottom end of XC bikes that are not a race specific model and will be competing for trail space on the weekends against the Kona Satori and the FSR. I am wondering if 120mm will be the new sweet spot? Could be. I need to try one to find out. In the meantime, if a blue and black blur passes you on the trail and the rider is giggling like some adolescent at the cartoon matinee, it might be me. I would have said hi, but I was having too much fun to stop and chat. Life is gettin' good when you start talkin' the way you are, my friend! Bring on the big, fun bikes! I want 'em! Thanks for being willing to give the big bike a go. I'm glad it's working out for you and you're having so much fun.